Travis is missing his old home in the country, and he’s missing his old hound, Rosco. Now there’s just the cramped place he shares with his well-meaning but alcoholic grandpa, a new school, and the dreaded routine of passing when he’s called on to read out loud. But that’s before Travis meets Mr. McQueen, who doesn’t take “pass” for an answer—a rare teacher whose savvy persistence has Travis slowly unlocking a book on the natural world. And it’s before Travis is noticed by Velveeta, a girl whose wry banter and colorful scarves belie some hard secrets of her own. With sympathy, humor, and disarming honesty, Pat Schmatz brings to life a cast of utterly believable characters—and captures the moments of trust and connection that make all the difference. A lovely, understated book that celebrates the possibility of a kind and humane friendship between an eighth-grade girl and boy...this novel is also an ode to the significance of reading in the lives of young people and to a teacher who knows the power literature can wield. Unique and original, believable and poignant, this is a book with power of its own. Readers seeking emotional warmth, congenial humor, and an affirmation of forgiveness and friendship will cozy up to these characters. 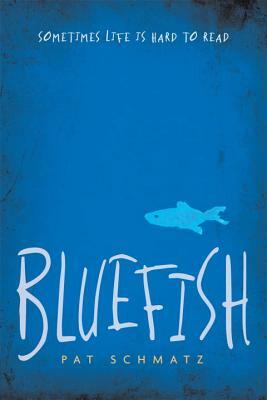 Despite the weighty problems the characters face-grief, alcoholism, and bullying among them-Bluefish is a lively, often-humorous, and ultimately hopeful page-turner. It has all the hallmarks of a classic contemporary young adult issues novel. It's packed with memorable and believable characters and powered by the prospect of redemption and just a hint of romance. A young teen loner gradually learns to accept the friendship of an outspoken girl in this problem novel filled with likable, idiosyncratic characters.… A story rife with unusual honesty and hope. What makes Bluefish compelling is the unorthodox way the characters reveal their secrets and ultimately join forces to break hurtful social labels. Readers will identify with the middle school setting and the well-written characters. The story is well written and deals realistically with issues that plague many teens. This inspiring novel demonstrates how two teens with survivor instincts and a little guidance from a couple of perceptive adults choose a different path than the one they were born into. Schmatz keeps their situation realistic while also emphasizing the importance of seizing opportunities when they present themselves.